Whilst asparagus plants grow into tall bushy ferns in the summer it is the young tender shoots that come up in spring that are so delicious. Read on to learn about asparagus plants and buying them for your asparagus bed. Asparagus officinalis (the scientific name) is part of the Lily family. It has a tuberous root system that lives for many years sending up fresh tasty and edible shoots each spring which grow into tall fern like plants that die back in the autumn. 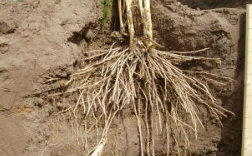 The terms asparagus plants and asparagus crowns are used interchangeably but the plant actually comprises a crown, which is a collection of rhizomes and lateral roots, a fern which grows above ground and a wider spread of roots.The part of the plant that is eaten is the young shoots that if allowed to grow on form the stalk of the asparagus fern. The young shoots are tender and have a tight pencil like shape with a "tip". As the tips start to open out the stems get tougher, stronger ready to support the weight of the ferns. This is why you should cut asparagus before the tips start to unfurl. 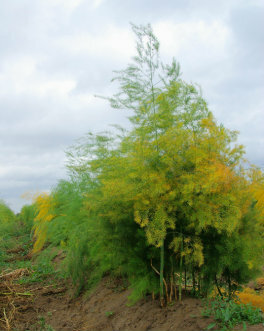 Asparagus plants are either male or female. The females produce berries and producing those berries uses up some of their energy. As a result you are likely to get better crops with the male plants. Some varieties have been bred to produce primarily male plants whilst others produce both. If you grow from seed you can weed out the females when you first see them produce berries.Good quality hybrid crowns bought for planting will typically be predominantly male. As with most plants there are a range of varieties to choose from. White asparagus is not a variety but a type of asparagus resulting from growing the plant without light. Purple asparagus by contrast comes from a number of varieties that are purple in colour. The different varieties vary in characteristics such as early or later arriving, tolerance of particular climates, disease tolerance, sweetness, tenderness etc. Growing a combination of varieties can lengthen the harvesting season and provide subtly different flavours (e.g. purple is often very sweet so is good for eating raw). If you plan on growing asparagus you need to decide which variety to buy, whether to buy pot grown, bare rooted or seed, where to buy them from and what time of year to buy and plant them. 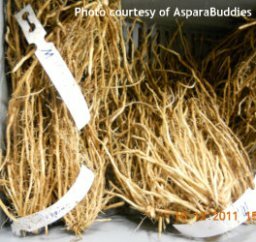 There is more choice readily available in asparagus plants or crowns than asparagus seed. If you choose to plant from seed you might have to look a bit harder to find the variety you are after. Most commonly available are loose crowns. The plants are grown from seed in nurseries by specialist crown suppliers. They are usually sold as 1 year old crowns although some suppliers will sell 2 year old crowns. The process of growing these crowns is carefully controlled starting with the preparation of the seed to ensure no cross pollination of varieties. The crowns can be kept out of the ground during their dormant period for a while providing the conditions are good although the shorter this period the better. 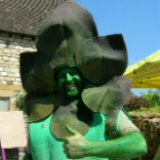 As a result it is possible to buy crowns by mail order or from a local garden centre or nursery. Most asparagus plants are grown for spring planting, however it is also possible to buy and plant asparagus crowns in the autumn. Some believe that planting in soil still warm from the summer period in the autumn enables the plants to settle in better, however the majority of planting takes place in the spring. Growing from seed is inevitably going to need a bit more patience as most asparagus plants are 1 or 2 years old so you have 1 or two more years to wait before you can start harvesting asparagus spears to eat. The bonus is in the cost. Make sure you buy seed from a reputable source and be sure to understand the difference between the seed that is sold in the hundreds for a couple of pounds to the seed that is coats around £2 - £3 for 10 seeds. Essentially the expensive seed will be F1 hybrid seed collected under controlled conditions to avoid cross pollination. The cheaper seed tends to be for what are called heirloom varieties such as Connovers Colossal and Mary Washington. These varieties are very long established and much loved. They will not produce as large a yield per crown as the F1 hybrids and may not have the same disease resistance but if space if not a limiting factor and you plant a big bed then you will still get some delicious asparagus to eat. If you have the patience it may be worth the wait especially if you plan on establishing a large bed. A few suppliers sell young plants growing in plugs for planting in late srping early summer and some sell asparagus plants in tubs ready to go. Whilst you can have some success with asparagus in tubs they cannot be expected to crop as well as those planted where their roots can reach over a metre in depth. We have been reviewing the market and list here the various suppliers we have found that supply asparagus plants by mail order. Please let us know of other suppliers and we will add them to our list. Along with our expert Jamie Petchell we have pulled together some frequently asked questions about planting and transplanting asparagus. We also welcome your questions which we will endeavour to answer.